REGRETS FROM THE BOTTOM OF MY HEART. When I received the pre-Sammelan issue of Sindhishaan ‘ JAKARTA CALLING; I felt not only was JAKARTA calling me and many more Sindhis from around the globe, but my friend Ranjit Butani, the editor of Sindhishaan, was himself calling me through his eloquent pages. And of course the two towering smiling personalities on the cover page – Shyam Jethnani and Suresh Vaswani, though had their arms alongside gave the feeling that their hands were folded and arms wide open, welcoming all Sindhi brothers. My other friend Ram Jawhrani, the guest editor of this issue, has proudly spoken about the age of International Sammelan. I disagree with him; International Sammelan is only five years old. The first International Sammelan was at Indore (which we have been forgetting conveniently) then at London, Mumbai, Singapore and now at Jakarta. For all these Sammelans credit goes to the local organisers only and not to Alliance. Alliance is only confined to USA and not outside its borders. The position of Alliance is like they say in Sindhi ‘paraae duhile ahmaq nache’. Brother Srichand Hinduja has correctly depicted the characteristics of Sindhis being real Indians. And how can I not mention Arun Babani’s article on International Sindhi Sammelans, starting with a pinch of critical and cynical approach but ending on a positive note. Fortunately, I happen to be part of 60s/70s Sammelans and the present day Sammelans. Those were on Indian soil and now these are all over the globe. It is a fact that the literary group cannot afford to attend these Sammelans due to the cost involved. Literary stalwarts like Kirat Babani, Satish Rohra, Moti Prakash, Krishin Rahi, Baldev Matlani, Lakhmi Khilani and a few more were earlier invited and their travel costs paid for. N.C.P.S. L. could be initiated so that at least two to three litterateurs can participate in these Sammelans N.C.P.S.L have funds available and at least those writers who have been acclaimed by Sahitya Academy should be considered. On the following pages were beautiful pictures of Jakarta – glimpses of history of Sindhwarkis and their glorious achievements in various fields. Enthusiastic, vigorous and hardworking organisers and pillars of GANDHI LOKA SEVA, with the sole aim of fostering the spirit of love, understanding and brotherhood were to be our hosts. AND I MISSED THEM ALL. I am still surprised how I missed this Sammelan. I regret it from the bottom of my heart. 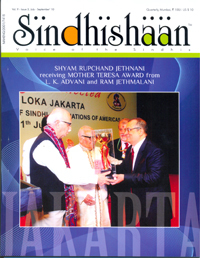 When the Sammelan issue of Sindhishaan will be released it will contain a beautiful coverage and reports as usual. I am sure I will regret it even more. Not only I but many, many more who missed this Sammelan. Wish time could be reversed and this historic Sammelan could be repeated so that not only myself but many more could attend. LESSON OF THE STORY IS NEVER MISS ANY INTERNATIONAL SAMMELAN AND AVOID REGRETTING. I received Jakarta Sammelan brochure with three copies of Sammelan Buzz. Extremely informative and a real eye opener – Speakers of the day; stalwarts of the Sindhi Community; lest we forget... from the archives remembering the original Sindhwarkies who established flourishing businesses in Indonesia and other far-east countries; bio data of present Gandhi Seva Loka members; major attractions of the Sammelan; well-staffed hospitality desk; synopsis of The Ramayana Ballet performed by the Indonesian artists, which proves the adaptable character of Sindhi Community; glimpses of the art gallery of Sindhi artists; Sindh-past glory and present nostalgia; facts about Sindhi tradition and culture; the definition of Sindhyat; programme details of all the three days; menu of lunches and dinners and Jakarta in pictures then and now; a beautiful slogan ‘STRIVING TO STAY CONNECTED’ not only among our Sindhis but our culture, language, literature and our heritage; the Cradle of Civilization, Mohen Jo Daro on the cover page reminding us of our deep roots with our separated but not forgotten LAND – SINDH. Hats off to all the committee members, who made this memorable Sammelan a great success and left not only me, but many others throughout the globe, FULL OF REGRET.......!